R-kun came again Friday for his English lesson. 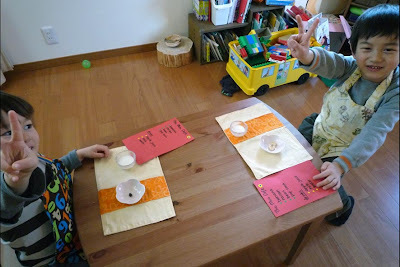 We started off with some reading and writing games then at snack time I invited them to the 'Mini Cafe' They both had a menu with a list of foods and drinks and I was the waitress. Ebi-kun ordered raisins and milk and R-kun ordered banana and milk. They had a bit of a shock when their order arrived with just 1 raisin and 1 slice of banana and a small sake cup of milk hahaha. When they had finished they had to call the waitress and order again, this gave them lots of practice and I threw in lots of questions such as 'Would you like that hot or cold?' 'With or without ice?' I also pretended that I couldn't understand anything Ebi-kun said so that R-kun had to order for him. There was a lot of giggling and later Ebi-kun asked if he could have his dinner at the mini-cafe! After the cafe had been cleared away, we got out the art cards. It is a while since I have played this with Ebi-kun. I laid out one set of the cards and the other set went into a pile. 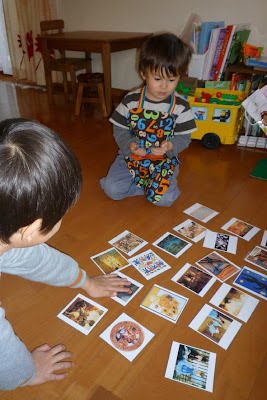 Ebi-kun picked up the first card from the pile and tried to describe the picture and R-kun had to pick the one he thought it was. I had to help R-kun a bit with the descriptions but all in all in went down well. If you want a copy of the cards they are here. At the back end of last week I also had an order for 20 pouches that all had to be different, a great stash buster :o) I managed to get them all done by Saturday morning, it is a pain not having a permanent sewing spot, I have to keep taking the machine out, doing a bit and then putting it away, I enjoyed putting them together though, they are now winging their way to England, I hope they make it through the snow! There is still time to enter the giveaway, I will make the drawing on the morning of the 12th MY time. Also, thank you for the links love, I will be adding them when I get a free 10 minutes or so but now I am off to do the housework - joy~oh~ joy. Cute pouches - I love the fabrics! Hi - thank you for dropping by my blog and taking the time to comment. I am happy to report that the snow seems to have melted a little this morning, so the schools have reopened (some of them, anyway). 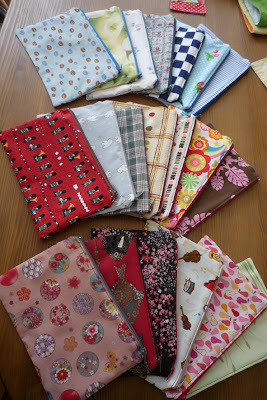 I love the pouches you've made - one of my things 'to do' this year is to attempt zips! love the mini cafe idea..wil try it with hafiy soon! The pouches look amazing. I can't wait to get them. I showed the picture to my head teacher and she was so pleased! They'll go straight into service. I'm going to look at the fabrics and plot themes!